Stephen Colbert, of "The Colbert Report" fame, debuted on "The Late Show With Stephen Colbert" in September 2015, following in the footsteps of longtime "Late Show" host David Letterman. If you're going on a trip to New York City and are a fan, you can get tickets to see the show live. You can request free tickets to see "The Late Show." Tickets are generally available four to six weeks in advance. The show releases tickets in blocks, so check the website frequently to find newly released tickets. There is a two-ticket limit per request, and you're only allowed to attend a taping once every six months. Guests must be over the age of 16. All attendees need a government-issued photo ID for entry; the person who reserved the tickets must have a government-issued ID with a name matching the reservation to claim the tickets. This show is virtually always sold out (meaning ticket requests are all booked) well in advance, and it is impossible to get day-of-show tickets. So you must plan well ahead if you want to see Colbert live. The show tapes nightly at the Ed Sullivan Theater at 1697 Broadway, between 53rd and 54th streets. The closest subways are the N/Q/R trains to the 57th/7th Avenue stop and the B/D/E trains to the 7th Avenue stop. 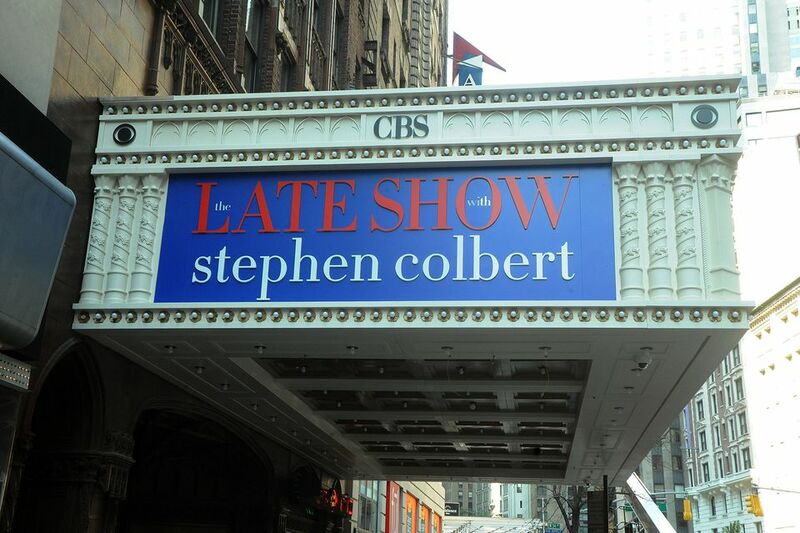 "The Late Show With Stephen Colbert " typically tapes Monday through Friday. The show tapes at 5 p.m. and generally lasts until about 6:30 p.m. The line-up for ticket-holders begins at 2 p.m., and you must arrive no later than 3:15 p.m. or you risk having your spot given to someone on the standby line. All tapings are overbooked, and you are not guaranteed a ticket, so getting in line as early as possible is a must. Large packages, shopping bags, backpacks, and suitcases are not permitted in the studio, so make sure to drop off your belongings at your hotel before you arrive. Small purses are allowed. The dress code for the show is described thusly: "Your mom might see you on TV" casual. Bring along a sweater or jacket if you're attending a taping since they keep the studios pumped full of refrigerated air. You are not allowed to use cell phones, cameras, or other recording devices while in the studio. If you do, you risk having them confiscated or being asked to leave the theater. Food and beverages are not permitted inside the taping. You must stay for the entire show. If a show gets canceled for any reason, ticket holders will be notified via e-mail or phone by the Late Show staff. The Ed Sullivan Theater is located on Broadway just north of Times Square, so it's a very convenient location for New York City visitors with lots of other things to do. You could hit the TKTS booth before lining up for the taping and attend a Broadway show after your taping. If you want to get dinner after seeing Stephen Colbert, there are plenty of restaurants in Times Square, as well as great places for pre-theater dining.